Except as noted, the items on this page are one-off pieces and are not available. They are intended to give you an idea of what might be done. Remember, think custom. 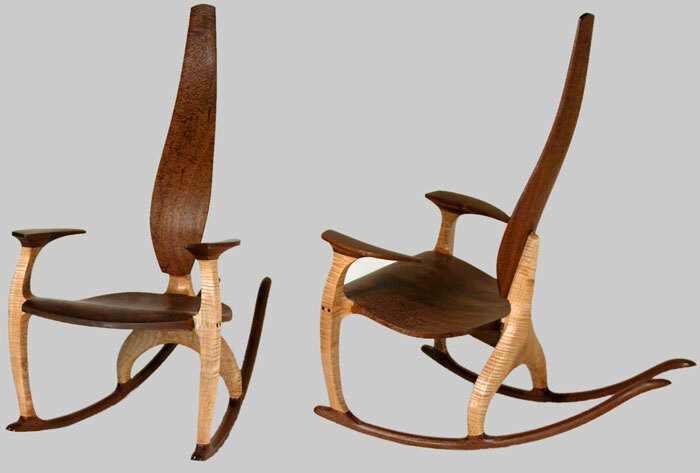 This chair is included in Lark Books Spring 2008 release of "500 Chairs". 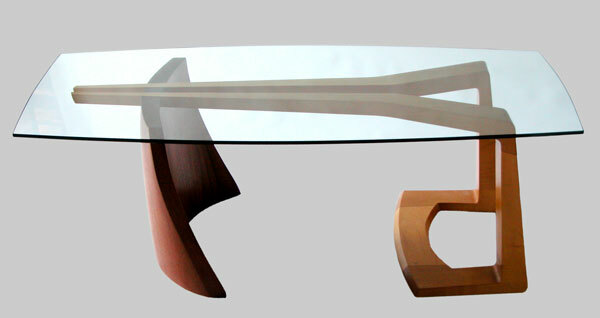 Maple, mahogany, and glass -- each a separate piece. 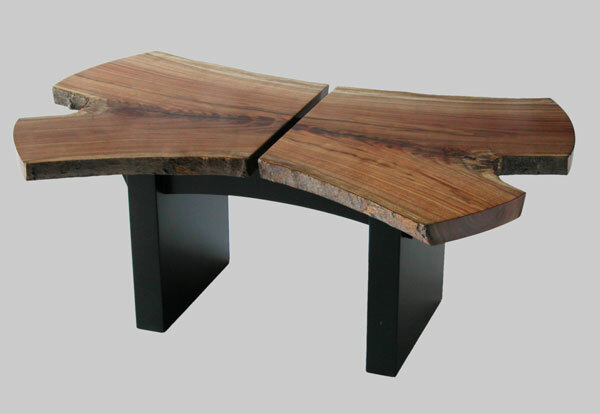 The maple horizontals nest into matching cutouts in the mahogany. It is intended to evoke motion or action, like wind pushing a sail. 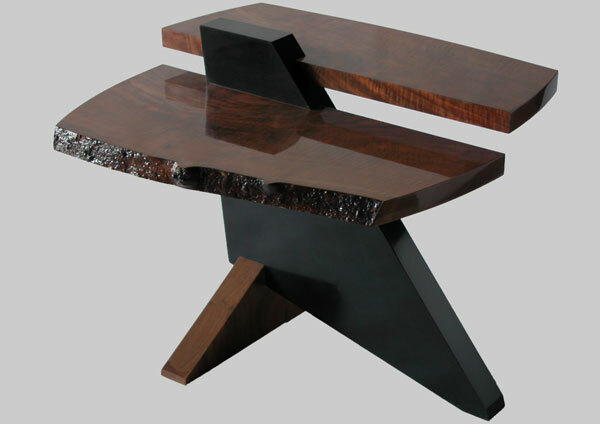 Walnut and Ebonized Walnut. This table was intended to showcase a particular piece of wood that was placed before me one day with the question "What should I do with this?" Since completing this piece I have been looking for another hunk of walnut for a top like this one. The closest pieces I have come across were half-rotted, three years from being dry enough to work, and the seller wanted $500. Maybe some day. 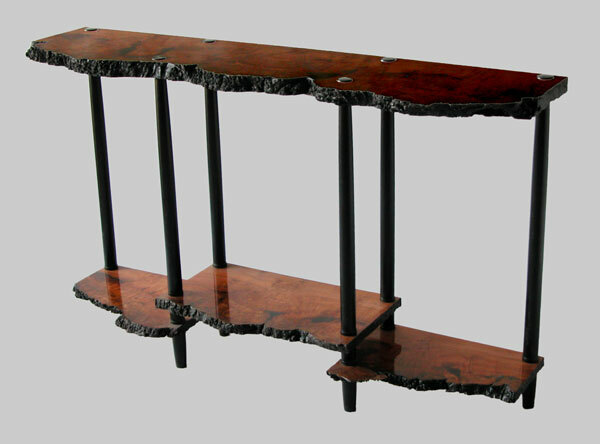 Click here to see a top view of the table that shows the figure of the wood. Cherry Burl and Ebonized Cherry. Another table designed around a specific board. It is used to display the owner's collection of small bowls. Click here to see some of the many burl formations in this one piece of wood. Mimosa (AKA Japanese Silktree) and painted Cherry. The tree was felled because the roots were infiltrating sewer lines. The man having it cut down was the same person that planted it many years before. He was going to burn it in his fireplace. I collected what I could and after four years of air drying I was able to get this table out of part of it.